The Department of Mathematics urges every student interested in taking a mathematics class in their first semester at Johns Hopkins to take a placement exam. If you have had NO prior training in calculus, take Placement Exam 1. If you have had ANY prior training in calculus, take Placement Exam 2. The Mathematics Placement Exams are available online on Blackboard. To enroll in the Math Placement Exam Organization on Blackboard, log in to your Blackboard account in a separate tab. Then enroll here. The placement exam site will be available all summer. Please report any problems to placement@math.jhu.edu. Even if you are entering with AP or IB credits for calculus, you should still take the placement exam. We have found that AP and IB courses can vary wildly from school to school, and there is a great difference between how we teach calculus in college versus how a typical high school course is taught. Our focus is theory- and concept-based rather than based on calculation and technique alone, and it may be that achieving even the highest score on the AP or IB exam may not ensure adequate preparation for what Hopkins calls Calculus II. Please note: The placement exam is an advisory tool to help us gauge your preparedness for mathematics at a proper level here at Hopkins. It is not a means to “pass out” of a particular course, and credits will not be issued nor a waiver granted solely based on a placement exam score. If you feel you need more advice, please contact the mathematics department’s director of undergraduate studies, Professor Richard Brown. 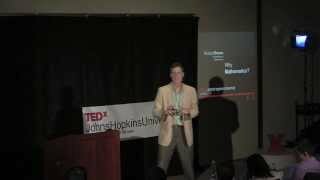 Prof. Richard Brown’s 2014 TEDx Talk: "Why Mathematics?"